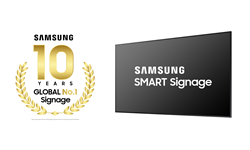 For the 10th consecutive year, Samsung Electronics Co., Ltd. has maintained its position as the No.1 worldwide leader in digital signage as measured by unit sales. Recently released data from IHS Markit, the leading provider of digital signage market data, identified Samsung as the top selling brand in the industry since 2009. Note: Consumer TVs, along with Commercial Lite and Hospitality TVs used for signage are excluded.